For the past decade or so I've read the following "Christianized" version of The Night Before Christmas at the pageant service on Christmas Eve (the liturgy I affectionately refer to as the "Zoocharist"). I've adapted it depending on where I was serving -- Old St. Paul's in Baltimore or All Saints' in Briarcliff Manor, New York) -- so this is its third iteration. I find that kids respond to the rhythm of the verse and by that I mean it briefly lulls them to a more contemplative place amidst the pre-Christmas madness. I use this in lieu of a sermon which, if anyone cares to hear it, will be preached at the later services. 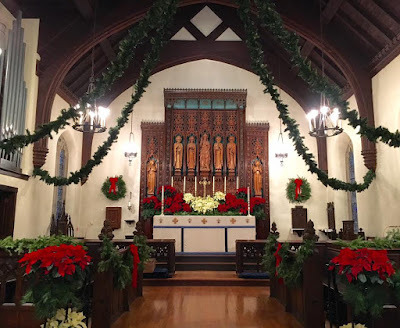 Of course the calming effect is short-lived and it doesn't help parents much when I hand out candy canes (or candy croziers as I call them) after the service. If any clergy would like to adapt it to their own use, feel free. I'd love to hear about it and look forward to receiving a fine bottle of single malt Scotch as an adequate thank you. So good! May I have permission to crib and alter it to fit this side of the pond? But of course. Merry Christmas! Here is my adaptation, I hope you approve. The excitement was building, Christmas Eve was upon us. While visions of angels brought tidings: Good News! The trees were all trimmed, What a lot of poinsettias! The little Lord Jesus, asleep he did lay. A choir of angels joins in the sweet song. On shepherds! On wise men! We all shall draw nigh. He is the great shepherd and we are his sheep. We pray that his light all people may seek.